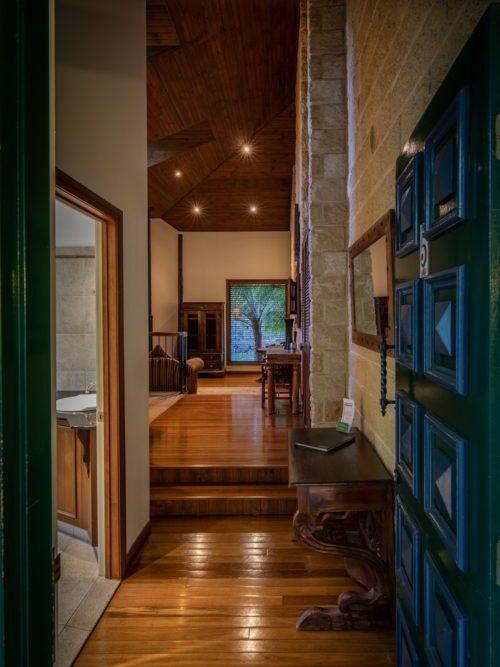 We all need to escape from time to time and our beautiful split level villas with their soaring vaulted timber lined ceilings provide the perfect place to recharge, relax and unwind. Looking for a quiet, secluded, private weekend getaway? Look no further. Set back from the road, surrounded by rainforest, The Escarpment Retreat is an adult’s only slice of peace and quiet. With beautiful Villas, and every mod con you expect, plus 2 person spa bath and four poster canopied beds, this place is serious about relaxation. Rebecca A. Our spectacular couples only villa is perfect for those looking for their next romantic Gold Coast hinterland accommodation. Each one features 5 metre high ceilings, sandstone walls, balcony, sunken lounge room with wood fireplace, granite kitchenette, and a generous bathroom, with large separate shower box plus decadent double spa bath. For those romantic nights in, the separate lounge area has a flat screen TV and DVD player so you can relax with a glass of wine and reconnect. To fully enjoy your romantic getaway in our bed and breakfast, each villa has a terrace with an outdoor seating area taking full advantage of the fresh pristine mountain air and environment in a beautiful garden and rainforest setting. The generous but intimate villas are designed to provide space and comfort with air conditioning, ironing facilities, robes and more. To create a quiet, comfortable and relaxing environment for all, wedding preparations and visitors are reserved for the Edge House and are not allowed in the Villas. Villas are strictly for couples only. Strictly only products provided by or purchased from The Escarpment Retreat are to be used in the spa bath. Bath bombs with glitter, stars and other non-organic ingredients interfere with the bicycle and function of the spa filters, the repair costs (approximately $150) will be passed on to the guest. The organic bath bombs that we have for purchase are especially made and can be purchased for $5. After a wonderful sleep in our four poster bed, enjoy a complimentary delicious home-made fully cooked breakfast in our dining room overlooking the rainforest where you will hear the gentle sounds of the waterfall below. Indulge in the range of juices, cereals, breads/toast, condiments, fruit and yogurt. We also offer smooth 100% Arabica coffee freshly brewed and a selection of fine teas to complete your Mt Tamborine morning breakfast fare. Relax in the pristine mountain environment just 40 minutes from the Gold Coast, 500 meters above sea level with cooler temperatures of up to 5 degrees. 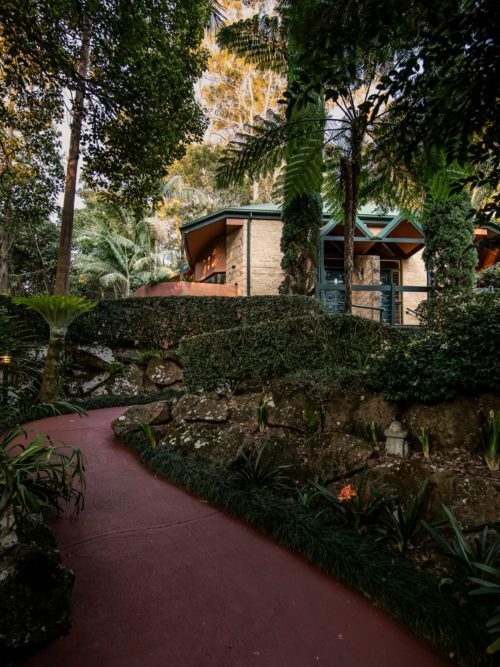 The on-site award-winning rainforest Day Spa, manicured gardens, serene surroundings and breathtaking valley views at the back of our property makes the Escarpment Retreat an ideal place to get away from the stress of city life. Located just an hour from Brisbane, yet it feels a world away. No matter what the occasion, an Escarpment Retreat gift voucher really is the perfect present. 5 years on from our first visit to Escarpment Retreat in Mount Tamborine, QLD, and we could not be happier! My fiancee and I have very fond memories of our time at Escarpment so we were extremely pleased to see that the cabins remain in fantastic condition with beautiful bed, spa bath and of course the fire place (which we used a lot due to the very cold weather!). We enjoyed our breakfast which was provided as part of the stay and spent time wandering the property taking in the beautiful valley scenery. I can’t say enough positive things about Escarpment. It really is the perfect romantic getaway where you can forget about the rush of life and just sit back and enjoy some time together.